Entering the Indian Institute of Technology (IIT) at Powai in Mumbai, smacked of threshold. Just beyond the gate, city faded without you quitting city. A verdant green canopy took over, you felt lungs and oxygen. Building blocks housing the institution’s schools, hostels, recreational facilities – they loomed to view. The tranquility and space was so unlike Mumbai. The place seemed built for running. On the other side of threshold, when you don’t have IIT, you create IIT in the head. A morning walk in city yet to go crazy; a morning run, time spent cycling – they open threshold in the head and gift you the IIT you miss. Two scribes with IIT in the head; to meet, was someone who ran daily at IIT. A student dressed in shorts and T-shirt, running shoes on his feet, appeared at the lobby of the institute’s Vanvihar building, where we sat chatting. He looked inquiringly at our subject of interview. “ Carry on, I will join you later,’’ Sanjay Bhingarde said. The youngster trotted off. It was in 2004 that Sanjay found employment at IIT. In 2007, much before he was allotted a house in the IIT campus, he started running. Every day after work, he ran on campus and then left for home in Thane. Although he had no background as athlete or sportsperson, he says, he took well to running. But for a long time he didn’t bring his running to the events that lay on the outside, beyond the institute’s threshold. He was very worried about timing. Events seemed all about timing; post event talk – indeed all talk in running – was about timing. For close to five years, he kept his running a private affair. In August 2012, he marshalled courage and ran the half marathon at that year’s Varsha Marathon in Thane. He completed the run in 2 hours 35 minutes. “ The sight of people walking during a marathon was a comforting factor for me, who was attempting to overcome fears of timing. It was at that event that I got hooked to running events,’’ he said. Probably because he knew what he was overcoming to finish a run, post Varsha, he commenced a new practice – after finishing, he would run back along the track to encourage the stragglers. 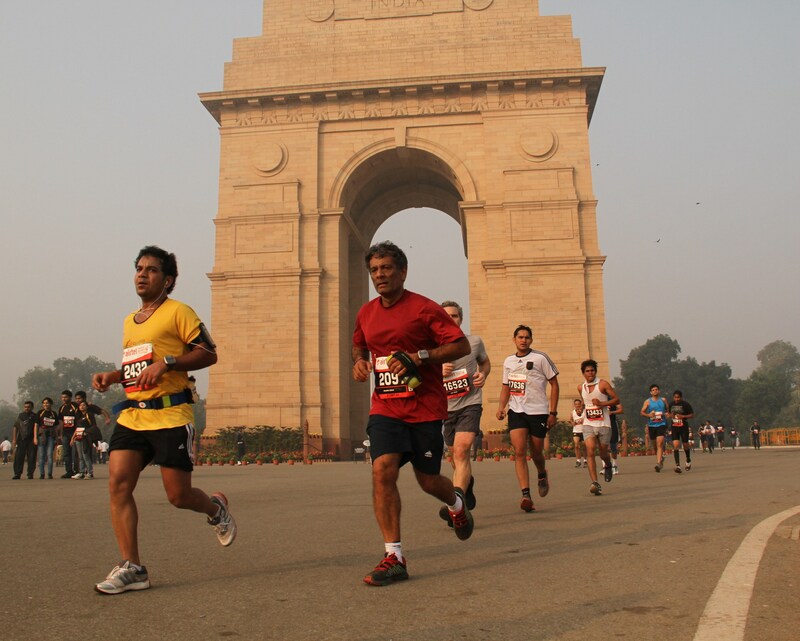 Sanjay soon began seeking out events to run at and running groups to be out with. In 2012, besides Varsha half marathon, he ran the half marathon events in Delhi (net time 1:57) and Pune and the half marathon segments of the Vasai Virar Mayor’s Marathon (VVMM) and the Goa River Marathon. He also ran a half marathon at night in Surat. Next year, he ran half marathons at Arrey in Mumbai and in Alibaug. Two things happened in 2013 – he started to try improving his personal timing; he also decided to attempt his first full marathon. Planning his daily runs accordingly, he graduated the weekend distance to runs of 20-25 km. 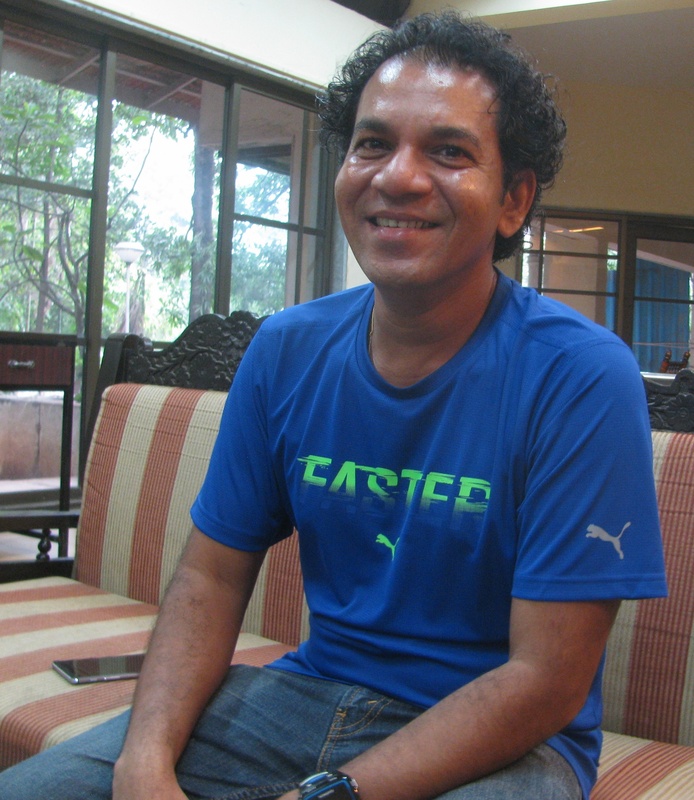 For a group to run with, he joined Mumbai Road Runners (MRR). “ People used to say that the Hyderabad marathon is the toughest among city marathons in India. 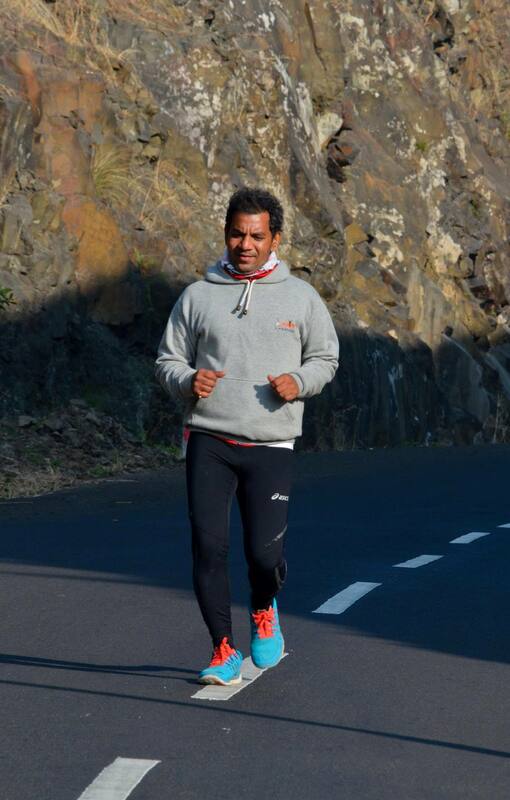 So I opted for Hyderabad to do my full marathon,’’ Sanjay said. In 2014, he ran the half marathon at the Standard Chartered Mumbai Marathon (SCMM). In August 2014, he ran the 12 hour endurance run called Mumbai Ultra, held around the Dadar Shivaji Park-Worli area of the city. Starting at 5 AM and running till 5 PM, runners do many rounds of a six kilometer-loop. In 12 hours, Sanjay covered 77 km. End of that month he ran the Hyderabad marathon, his first full marathon, completing it in 5:44. “ That year, conditions were such that the Hyderabad run was a struggle,’’ he said. Two months later, running the full marathon in Bengaluru, Sanjay improved his timing by a whole hour, ending the race in 4:44. By that year’s VVMM in November, he had brought it down further to 4:30. The Mumbai Ultra had left him with an impression. “ I felt running really long distances is my forte,’’ Sanjay said. What tilted the balance was this: he wanted to enjoy his running and room for enjoyment seemed most in ultramarathons. “ In comparison, the pressure to return a good timing takes off the joy in running, from half and full marathons,’’ he said. While these thoughts were playing out, at the Yeoor Hills Run of 2014, Sanjay met Breeze Sharma. The latter had gravitated to running long distances by then; in fact, Breeze would grow so rapidly in the field in the following years that in July 2016, he successfully completed the Badwater UItramarathon in California’s Death Valley, often called the world’s toughest footrace. He was the second Indian runner, after Arun Bhardwaj earlier, to complete Badwater. 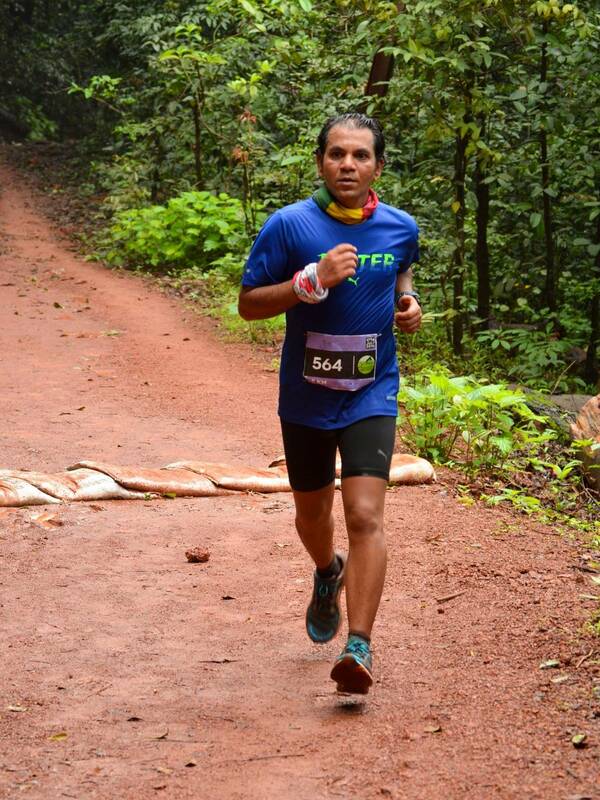 Sanjay told Breeze that he wished to attempt the 75 km-run at the upcoming Bengaluru Ultra. Although Sanjay had managed a creditable distance at the Mumbai Ultra, the event was designed for runners seeking a taste of ultra-running in a contained, safe – maybe even tad festive – environment. Breeze suggested that the duo do a 50 km-run as test to see if Sanjay had what it takes to run far. An afternoon, around 3 PM, they set off. The run progressed well; they even managed to increase their pace over the last two kilometres, a likely indication of reserves still available after some six hours of running, covering 50 km. Breeze recommended that Sanjay forget thoughts of doing the 75 km-run and instead opt for the 100 km-category. Accordingly Sanjay registered for that category at the Bengaluru Ultra, while Breeze enlisted for the 24 hour endurance-run. 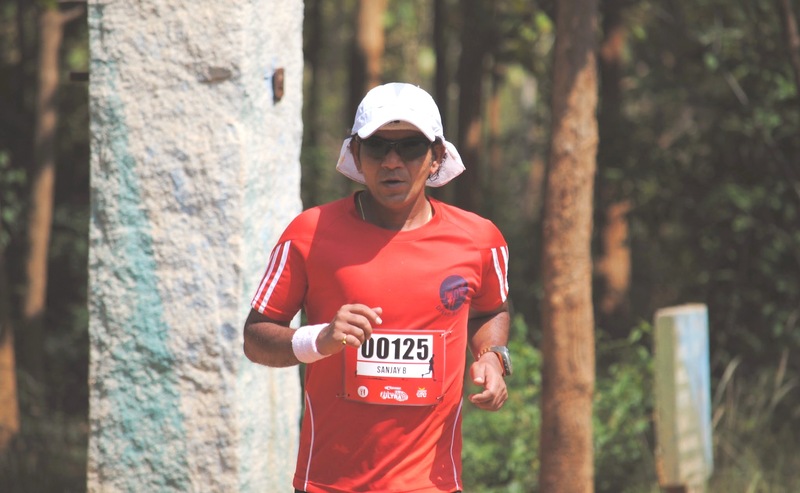 In Bengaluru, Sanjay finished his 100 km in 16:44. He felt encouraged enough to formally attempt a true blue ultramarathon, settling for the 100 km category at an ultramarathon in Gujarat’s Rann of Kutch. To prepare, Sanjay not only ran, he also began cross training. He started cycling. More importantly, he frequented the swimming pool at IIT. His swimming style honed in his village river long ago, was soon pointed out by the coach as something to correct. Correction done, swimming improved. He also bought a home gym. Ultramarathons are much smaller events than city marathons; they can be fully supported events with aid stations at regular intervals or partially supported ones. Sanjay’s 2015 ultramarathon in the Rann of Kutch was not a fully supported run. That meant runners, including Sanjay, had to carry three litres of water, some snacks, torch, extra clothes etc, all stashed into a small backpack. He completed the stipulated 100 km in 20 hours to place first. Then in September 2015, he tried his luck at a totally new environment for man living and running in coastal Mumbai. Ever since the Ladakh Marathon was commenced by the Leh based-Rimo Expeditions, one of it’s most important events has been the Khardung La Challenge. While not a very long ultramarathon, this run involves a full marathon worth of ascent to the high Khardung La pass (among the highest mountain passes in the world with a road through it) from the Nubra side, followed by a long descent into Leh town. The race has traditionally been dominated by Ladakhi runners. Sanjay, running at altitude for the first time and new to the mountain environment and its demands on the body, paid the price. He had to do a Did Not Finish (DNF). But later that year, he was back to the ultramarathon – this time placing second in a 100 mile race in Pune called the Western Ghats Ultra. In January 2016, he returned to the full marathon at SCMM completing it in approximately five hours. But his link to the full marathon had become tad indifferent. “ I don’t know why, I am not enjoying the full marathon anymore,’’ Sanjay said. The month after SCMM, he hit the Rann of Kutch to run an ultramarathon called, `Run the Rann.’ But Khardung La repeated and Sanjay, having suffered a twisted ankle at the 96th kilometre had to DNF. That’s where things stood when we met Sanjay at IIT. “ Sanjay is a good long distance runner with much potential. On his training runs he shows amazing endurance and that should translate into fine performance at events,’’ Breeze said. It was now sometime since that student had come and gone. There was an invitation to run waiting. You don’t stand between a runner and his daily fix. What next? – We quickly asked. To begin with there will most likely be returns to Khardung La and the Rann of Kutch to exorcise the shadow of DNF. There are thoughts of attempting the triathlon sometime. A reason being – his competence at swimming has improved vastly; at the annual endurance swimming event at IIT (open to students and staff) Sanjay swam 20 km in the pool, in 12 hours. He was also planning to do the 36 hour-stadium run in Bengaluru. “ Running round and round on a track can be mentally tiring,’’ Sanjay said. He has been on his feet continuously for up to 32 hours, before. If he can hold on for another four hours, he should be able to do the 36 hour-run, he reckoned. According to him, although he plans ahead for given distance, most of his ultramarathons have a transition stage – a threshold crossed – somewhere around the middle or past the middle. “ Let’s say, if I am running 100 km, then at around 50 km or 70 km, I exhaust my initial supply of fuel and energy and the mind asks: what are you doing? Why are you doing this? But the runner in me persists. I keep going till sometime later, gears kick in afresh and I am back in business,’’ Sanjay explained. He also had, tucked away, a personal source of energy and motivation, a bank of life experience he leverages to answer the mind’s questions when the body exhausts – he hasn’t forgotten his childhood in Dhamani. “ When the going gets tough, I think of my past,’’ Sanjay said. The Google Map image of Dhamani showed a few houses, some fields and plenty of green vegetation. It also had a marker for the local secondary school. Zoom out and the image from higher up grew to a mix of green and bald patches of earth, not surprising for a village in Sangameshwar tehsil, in Maharashtra’s Ratnagiri district. Sangameshwar – named so because it is the confluence of the rivers Sonavi and Shastri – is bordered on the east by the hills of the Western Ghats. At IIT, speaking of his early life in Dhamani was an emotional instance for Sanjay. Born April 1974, youngest in a line-up of two brothers and three sisters, Sanjay’s father who worked in Mumbai’s textile sector, disappeared when the boy was still very young. The family, residing at the father’s house some distance from Dhamani, never saw him thereafter. It cast mother and five children into a wretched situation. “ We were on the road,’’ Sanjay said. His maternal grandmother provided them space to live in Dhamani. But there was nobody to take care of them, stand up for them or protect them. They were on their own. The three sisters gave up their studies and moved to Mumbai, where they did household work, fended for themselves and sent a little money home. Back in the village, Sanjay’s mother did house jobs. Sanjay helped her. They worked at two to three houses in the morning, another two to three houses in the evening. “ We made twenty to thirty rupees and ate leftover food, the arrangement gave us at least one meal a day,’’ he said fighting back tears. One silver lining prevailed – young Sanjay who enrolled at the local Marathi medium school was good at studies. But sports, there was little for him. Malnourished, he was thin, of small size and easily picked on by others. He recalled the school teacher telling him that the school was very aware of the family’s distressed condition and the last thing school or family would want is fragile student injured through sports. Junior school completed, Sanjay did his high school and eleventh and twelfth (he opted to study commerce) from the New English School & Junior College, in nearby Kasba. By then his elder brother having finished his twelfth earlier, was already in Mumbai working by day and attending college by night. Sanjay also shifted to Mumbai, where he elected to do his graduation in commerce at the St Xavier’s evening college. He left this course in its second year and opted to study hotel management at an institute in Belapur, his studies funded by a loan from his brother in law. Around this time, his mother too shifted to Mumbai, taking up residence with her two sons in a Ghatkopar slum. From there, they worked their way to a dwelling in Kurla, ran a successful computer typing and photocopying shop in Thane and finally bought the first house of their life, in Thane. Having completed his hotel management studies, Sanjay worked briefly at Hotel President in Mumbai before shifting to industrial catering at Radhakrishna Hospitality. Amid this, there was a period when he worked in the catering section at Mumbai’s IIT. In 2004, he started working at IIT permanently, in the institute’s hospitality section, responsible for the guest house and the outsourced cafe. In due course, he was allotted a house to live on campus. His mother stays with him. “ When we go back to our village, people now speak of us as an example to others,’’ he said, voice cracking. Sanjay’s has been a life with thresholds crossed, just as in the ultramarathon. As we walked back to the institute’s gate, the roar of Mumbai’s traffic grew. Past it, we became one with noisy city. We had left one world, entered another. This entry was posted in Human Interest, People, Sports. Bookmark the permalink.